The WHO Executive Board is holding its annual winter meeting from 24 January to 1 February. WHO Director General Tedros Adhanom Ghebreyesus (Dr Tedros) provided details of fundamental changes set in motion at the UN agency. These include: a shift toward measurable impact; greater staff work and training at the country level; showing leadership and producing “world-class work’; and digital health and innovation. Dr Tedros opened his report to the Board with a story about his recent trip to Helsinki, Finland, where he learned about an initiative called Slash that focuses on ideas from students and attracted some 1,600 financers to fund their ideas. He wanted to follow this concept to inspire innovation and energy. The director general highlighted four “major shifts” coming to the organisation, including the “critical area” of digital health. “That’s why last year we launched a strategic partnership with PATH to develop our digital health strategy and accelerate the use of digital technologies for health,” he said. The future of health will be influenced by digital health in every way. He said WHO collaborated with Google “to integrate our evidence-based indicators for physical activity into the Google Fit smartphone app.” And WHO is working with the UN International Telecommunication Union to “find new ways of using artificial intelligence to get care to remote communities,” he said. He also highlighted new treatment guidelines for hepatitis C. “Combined with rapid price reductions, these guidelines are helping many more people to be treated and cured.” And he said on neglected tropical disease (NTD), he said one billion people received treatment, and 8 countries eliminated at least one NTD. Meanwhile, the Global Influenza Surveillance and Response System (GISRS), “tested some 4 million specimens to monitor the evolution of flu viruses, and more than 110 countries shipped samples to WHO Collaborating Centres for further analysis of the epidemic and pandemic risk of those samples,” he said. He also pointed to a “new concept” called EPI-BRAIN – Epidemic Big Data Resource and Analytics Innovation Network – which uses artificial intelligence to predict epidemics. Another mention was the establishment of an expert panel to develop global standards for oversight of human gene editing. Separately, some Board member states today asked for more transparency in the processes of the WHO, noting for instance that they had not received any updates from the secretariat since the last board meeting in June 2018. A major closed-door internal WHO meeting was held recently in Nairobi to apparently unveil some of the anticipated changes in the “transformation” of the organisation. Dr Tedros agreed to share a written update to the Board between meetings during the year and in general to be more transparent. 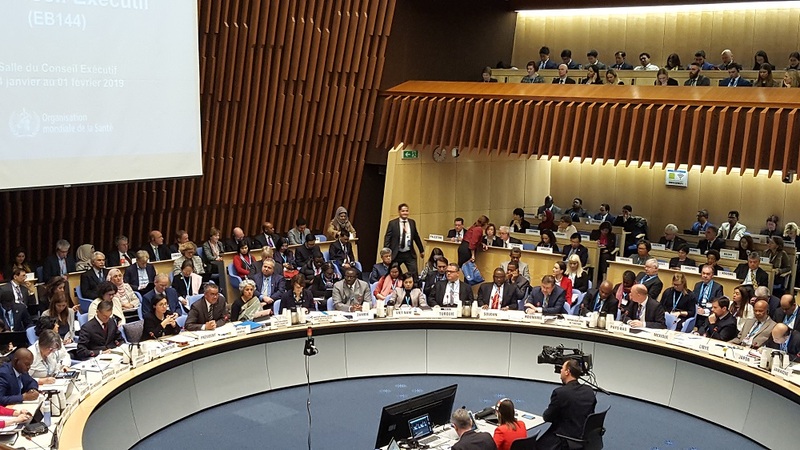 "WHO Director Tedros: Innovation, Digital Health A Major Pillar In WHO Transformation" by Intellectual Property Watch is licensed under a Creative Commons Attribution-NonCommercial-ShareAlike 4.0 International License.